As you may or may not remember, last week was Sick Baby Week. Wait, did you guys not celebrate Sick Baby Week? It was just us? That's a real shame. You missed out on a TON of fun activities and events that I'm sure you would have wanted to be a part of. Next time around I'll make sure you all get the memo. Among the many amenities that Sick Baby Week offers, some of my favorites are: - Not sleeping! - Constant crying! - A helplessness that manifests itself in the feeling that you have no idea what you're doing! - A complete lack of patience with everyone in your life! - And my favorite, the very real consideration of why you signed up for this whole thing in the first place! Seriously, though, guys, Sick Baby Week is THE WORST. It started on Sunday morning when our normally congenial little King Baby was grumpy and quick to anger. No matter what I did, he could only be pacified for short periods of time. This general fussiness continued through small group but we just chalked it up to teething which he's been threatening to begin for a couple of weeks. But after the group left, his temperature spiked and he was suddenly ON FIRE. His fever rose (up to 103.2) along with his anger and before long, it became obvious that this was Sick Baby Week and we'd better buckle up. Now, we've been very lucky and blessed to this point because on top of being an all-around cool kid, Cooper has been incredibly healthy. After that extra day in the hospital under the tanning bed right after birth, it's like he wants to make sure he doesn't have to go back ever, a stance that I wholeheartedly endorse. He's had one little baby cold that dissipated quickly and otherwise it's been smooth sailing. So this was a crash course in Sick Baby and it was BRUTAL. Sunday night was divided into shifts because A.) We had to make sure Cooper's fever didn't jump up into the 104 range (which is apparently the magic number for a doctor freak out) and B.) In his sickness, he reverted to his newborn way of life wherein he would only sleep if someone was holding him. 10 pm to 3:30 am was my shift then Lindsey took him through to daylight. Come the morning, we took turns hurriedly getting work stuff done while the other person sat with a screaming child who absolutely could not be consoled and would not calm down enough to sleep. We finally got to take him to the doctor's office where he sat whimpering on Lindsey's shoulder before nodding off into the best sleep he'd had in 24 hours...right before the doctor came into the room and had to jostle him. You're killing me, Smalls. Our doctor checked his ears, confirmed the suspected ear infection, then pried open his little mouth (side note: Sick Baby does NOT care for tongue depressors) and showed us the THOUSANDS, POSSIBLY MILLIONS of ulcers lining the back of Cooper's throat. AHHHH!!! It was a horrifying sight. No wonder Sick Baby is so incredibly angry, his mouth is one giant ulcer. Turns out, our little bundle of cries and shouts had contracted a hand, foot, and mouth virus on top of his ear infection. Here's the fun part though: There is no medicine for said virus. So...you just have to let it run its course. Now, I know I've only been a parent for six months. But in my experience, this is the worst sentence you can say to a parent because what you're really saying is, "You know how your child is literally screaming anytime he's not asleep and you have work and stuff that needs to get done but you can't because there are no breaks when you have a sick child and also you feel helpless because you can't help this little guy at all? That's going to continue for at least two more days." I was tempted to ask if he could give ME something to help me get through this week, like heroin or at least methadone, but he couldn't hear me over Cooper's screams anyway so it didn't matter. The next two days are somewhat of a blur, like that scene in Garden State where Zach Braff just stands in a sea of people as they run past him in fast forward except with a brain-numbing noise emanating from the crowd. We slept in shifts while the other cared for Sick Baby. I turned in one of the least valuable weeks of work I have ever been a part of and that includes the time I worked at Six Flags and spent the vast majority of a three day work week sleeping in the walk-in freezer. I came to live for Cooper's five daily feedings because at least in these moments he couldn't scream, only whimper as he tried to chug his formula. Truth be told, and I think any parent will back me up on this, while the screams and cries brought me close to death, the absolute worst part was the look of sheer bewilderment and genuine pain that my little buddy wore on his face while screaming and crying. Three days of that will seriously bring you to the point of wondering what in the world people were thinking letting you be in charge of a baby in the first place. The helplessness is the killer. 1.) Singing. I'm not a great singer and neither is Lindsey but during Sick Baby Week, you would think we were both warming up for an American Idol audition. 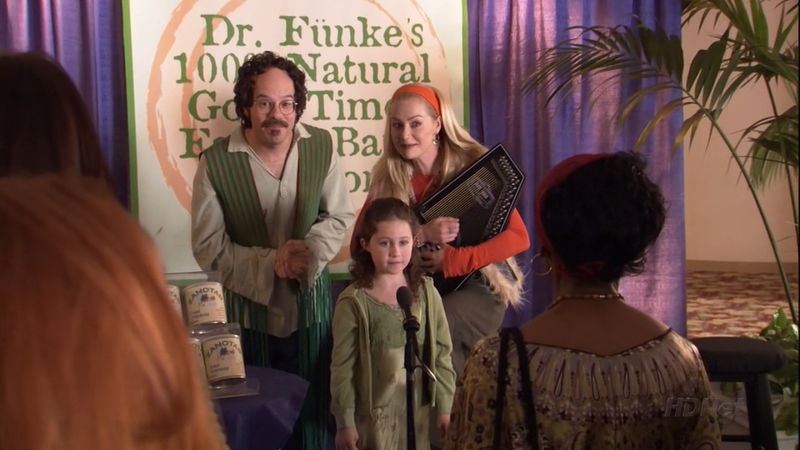 Maybe as a folk band like Dr. Funke's 100 % Natural Good Time Family Band Solution but who knows, I haven't really thought about it. I sing to Cooper a little when trying to get him to sleep but Sick Baby Week took this to a whole new level as I exhausted just about every song I could think of, in constant repetition, because it kept the kid quiet. Thank God for Rich Mullins, Kings of Leon, Mumford and Sons, and every other white person band that I've been listening to for years. And, yeah, so what if I did soothe him at one point with an acoustic version of Kanye West's "Gold Digger"? Don't judge me, ESPECIALLY during Sick Baby Week. 2.) Cell phones. Like all children of the 21st century, Cooper is mildly obsessed with screens, particularly the screens attached to our iPad and iPhones. He reaches and grabs for them continuously and it's always a fun game to try and send out that vital fantasy football-related text message while simultaneously keeping the phone away from the baby. In the midst of all the screaming and crying, we finally relented and Lindsey handed off her phone to Cooper, who was finally able to get hold of the thing he coveted so much...and promptly stick it in his mouth. Apple gives you a free replacement iPhone if your current one gets clogged with baby drool, right? Finally, on Wednesday night, we began to see the light at the end of the tunnel. Cooper was still angry but significantly less so, his fits of screaming and crying were fewer and farther between, and occasionally he even eeked out a smile or two. He slept through the night on for the first time since Friday and woke up his happy, smiley self, who demanded we let him go to YCW for the day. (Okay, so it was more like we demanded he go to YCW so that I might take an undisturbed nap.) Our trial was over and we were welcomed into the Brotherhood of Parents Who Have Made it Through Sick Baby Week Without Killing Each Other, though we were granted only partial access because I came very close to murdering our dog in order to release the tension of the week. I'll take what I can get.